Well that week certainly flew by. Last week I was in New York for work and missed my guys for three bedtimes. Sad face. Our weekend, however, was chock full of soaking up every sunbeam and blue sky day. And this week was an unending cycle of the stark juxtaposition of being glued to my computer during work hours (and a few and post-kid bedtime evenings), and playing/eating/laughing completely unplugged with my family in between. It’s the way it should be. It’s the way I want it to be. It’s what I work so hard for. Want to know what we did? Grilled dinner and ate corn on the cob and played on the swingset and went swimming at the town pond. Bathtime a little bit late and feet covered in dirt, but the kids were giggly and goofy right up until their heads hit the pillows. Benjamin and I clinked our glasses and smiled at each other over another happy day together. Pretty much every day. 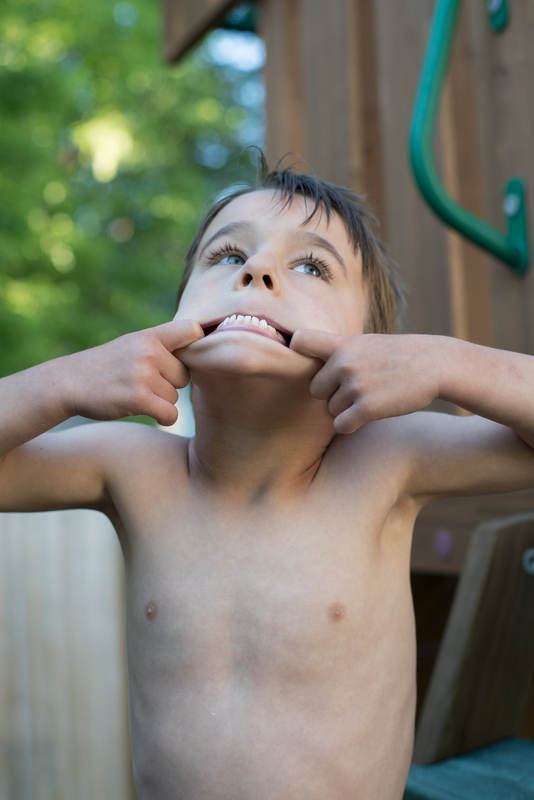 Work is nuts and our family is nuttier, and it’s a delicate balance to do both wholeheartedly without compromising. I find myself saying no to things and to people now, when I used to try to fit every gosh darn thing into every day. But when you get that balance right, even for a week? It’s glorious. We capped off this week with a pizza dinner eaten out on the swing set. Since I didn’t have to cook it, it was done mere minutes after we got home from school, which meant early dinner and plenty of post-dinner playtime. 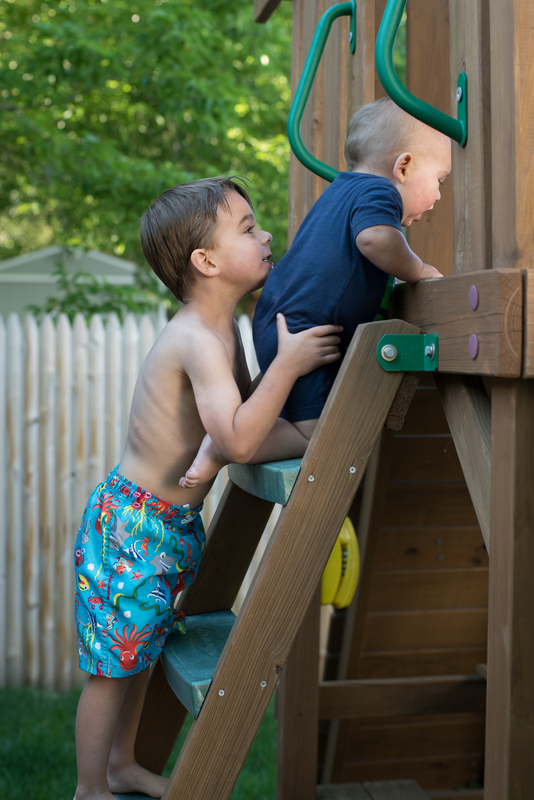 Then Owen deemed it time for “everyone to take their clothes off!” and after a bit more naked playtime in the backyard (kids only), we tossed those cute little butts in the bath and wrangled them into clean pj’s. The best kind of summer night. I have a feeling we’re going to be doing a lot more of this as the summer progresses. And I couldn’t be happier about that. 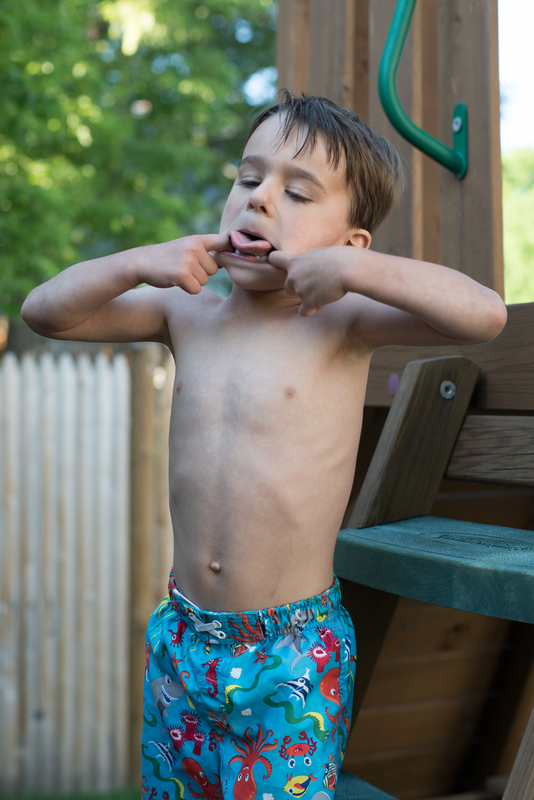 His little body bounces out of the car after school, shouting “BLAH BLAH BLAH” at the top of his lungs while simultaneously showing me how high he can jump (“almost as tall as Mount Washington! Sixty five fifteen forty high!”). He asks about 75 questions in 1 minute without waiting for answers… and then asks a few questions later, without pausing, why I haven’t answered him yet. He leaves the door to the garage wide open, icy cold air seeping into our cozy house, strips his coat off and throws it on the floor. Seemingly impervious to the cold air, he drops down to the floor right in the open doorway (blocking anyone else from entering the house, even the person carrying his chubby little brother in the astonishingly heavy carseat), pulls his shoes off without unvelcroing them and tosses them into the air in a celebratory fashion, laughing no matter where they fall. That’s only kind of what I meant when I set the expectation that we all take off our shoes and coats right when we walk in the door. He races through the kitchen in his paint-stained sweatpants and undoubtedly rainbow shirt (no matter how many other shirts he owns, anything rainbow is going to be the favorite) with a twinkle in his eye, asking “Do you wanna see how fast I can run?”. There is no answer other than yes. He flings open the doors to the toy cabinet in the living room and starts pulling things out. “Do you wanna play Candy Land? …or cars? …do you wanna play with me? Who can play with me?”. The questions come rapid fire and I do my best to dodge the ones that will make him upset and distract him with the answers I can give remotely while I balance the baby on one hip and attempt to get dinner started on the stove as quickly as possible. He shoots tiny toy cars all over the kitchen floor (“wanna see which one wins?” and “look how far they can go!”) and then abandons them to ride his plasma car around our first floor. Thank goodness that our house has a circle for running and riding. He whizzes past me making silly faces and silly sounds each time he comes through the kitchen. I echo them and a new game is born. I am relieved it appears to be one I can play while still using two hands to make dinner and keeping one eye on the baby. I stick the baby in front of a cabinet full of water bottles and let him go to town pulling them out and sucking on them, one by one, before he tosses them into the middle of the kitchen. Ignore the fact that they will all have to be washed once this little display is over. I don’t want to put him down after a day spent at school (no, all I want to do is nuzzle my nose into his chubby neck and breathe in his delicious baby smell), but I have to capitalize on the rare calm moments when I can. Yes, this is as calm as it gets around here in the evening. Making dinner is like an obstacle course, leaping over pointy cars and rolling water bottle tops. Owen has finished riding his car, leaving it somewhere between the front door and the kitchen to undoubtedly taunt the dog (who is terrified of the wheeled creature he is sure is out to get him — and with Owen behind the wheel, he might be right). 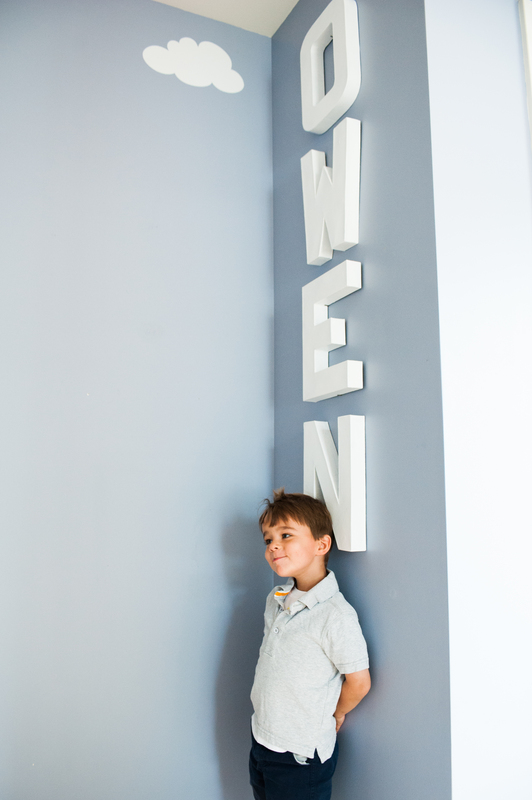 He writes his name in scrawly, rotated letters on the chalkboard that sits in our front hall for whenever the artsy feeling strikes (“Mommy! Come see what I wrote! O-W-E-N!”). He wipes his chalk dust covered hand on my pants and starts building a maze to roll little tiny choking hazards marbles around in. I run back in the kitchen to flip the salmon I have miraculously gotten in a hot pan with some oil and salt and pepper. The baby bleats like a little lamb as he is stuck on his tummy, surrounded by water bottles and travel mugs and plastic cups. A miniature beached whale swimming in mid-air, his arms and legs flailing in a valiant attempt to move his body forward. 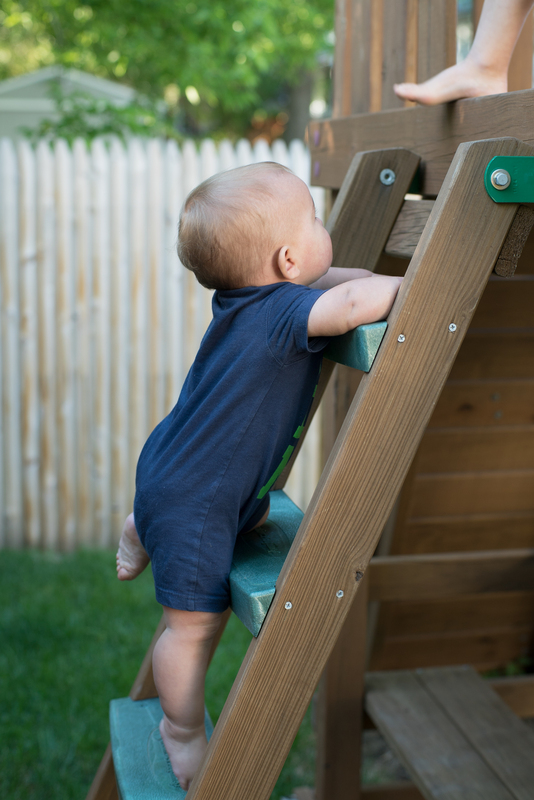 He’s so close to crawling we can taste it, but he just can’t figure out how to get those knees up underneath him. 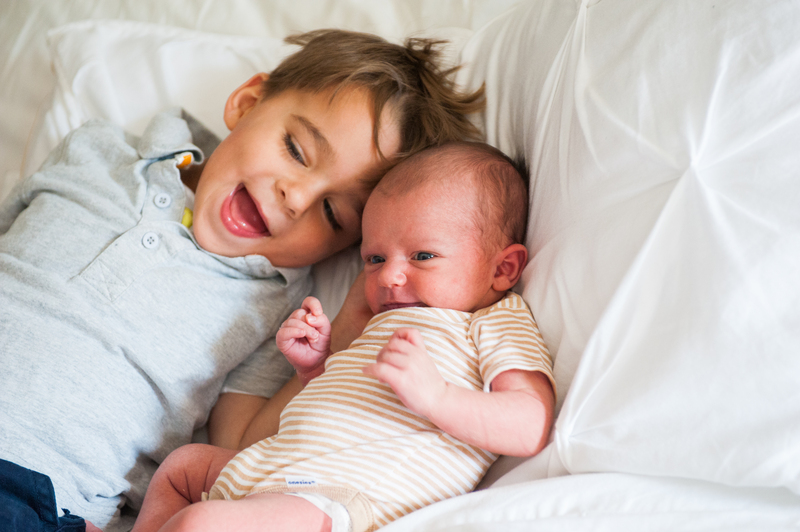 Though I know it will open up a whole new world of challenges having a mobile baby, I think it will also ease some of the tension of having to carry him everywhere. The kid can’t stand not being in the action. And with a 3 year old as active as mine, the action is always a moving target. In a blur of portioning salmon and microwaving frozen vegetables and stirring some rice I prepped before I picked the kids up from school, dinner is served. And after another 10 minutes of cajoling Owen to wash his germy little preschool hands, we sit. Everyone is calm and quiet for 1 minute while the first bites of food are keeping their mouths busy. Then Owen is popping up and down from his seat, bringing different toys to the table “to watch us eat”, the baby is frustrated that he can’t get the little green bean pieces I’ve put on his high chair tray into his mouth, and refuses the mashed up sweet potatoes I’m offering out of spite or stubbornness or just being done with the day after having spent the last 9 hours at school. We shovel our food into our mouths and before we know it, it’s bathtime. 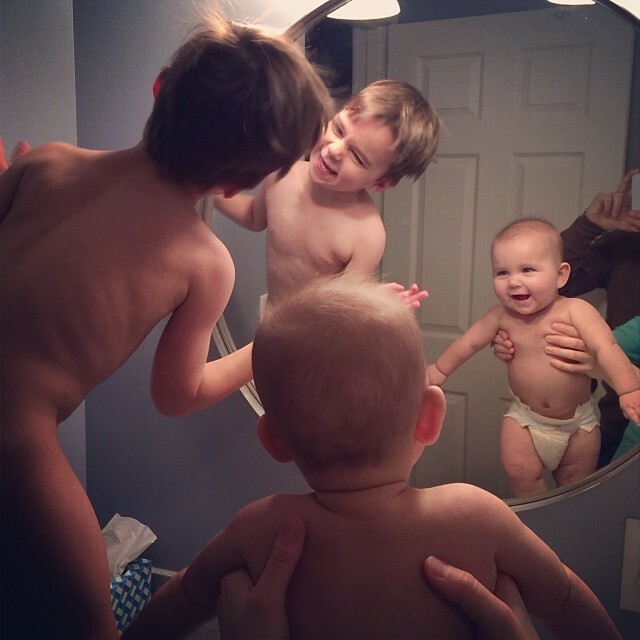 Completing bathtime with two energetic little boys is nothing short of a miracle. It is like a hilarious comedy show meets Olympic-level fitness test. They strip down naked, clothes strewn around the room like crepe paper garlands, and we all laugh and sing during our night time routine of countertop dancing. Teeth are flossed and brushed. Feet are scrubbed and faces are washed. Boys are pajamaed. Baby is bottles and Owen is read to, and finally, it’s lights out. I always marvel at the quiet once Owen is tucked into his bed. The silence is deafening. Benjamin does the dishes while I wander through our house, picking up the evidence left behind from the whirlwind that is a day at home with two crazy boys (or even the 2 hours between school and bedtime on school days). The clothes hanging around the bathroom. The piece of chalk on the floor. The abandoned plasma car. The cars stuck under the kitchen cabinets. The errant marble hiding in the corner. The drool-covered water bottles strewn around the floor. The tiny little sneakers in the middle of the hallway. The coat, arms inside out, still on the floor. Sometimes this evidence feels like a weight on my shoulders — the mess I am constantly cleaning up. But then sometimes I can see it for what it is. Little reminders that my boys are still so little. That I am lucky to have these shoes on the floor to clean up. That I am lucky to have these little messmakers making my life so full and busy. And I am thankful that I have so many reasons to be exhausted at night. We have Olympic fever up in this hizouse. But I’m still a stickler for screen time, so Owen hasn’t really gotten to watch much of it. (Benjamin and I, however, have spent most nights clicking away at our laptops while binge-watching any and all events. We sure know how to have a good time, eh?). Nevertheless, Olympic fever is contagious, y’all. So we’ve come up with some new events to occupy ourselves through all of the unrelenting snowstorms. 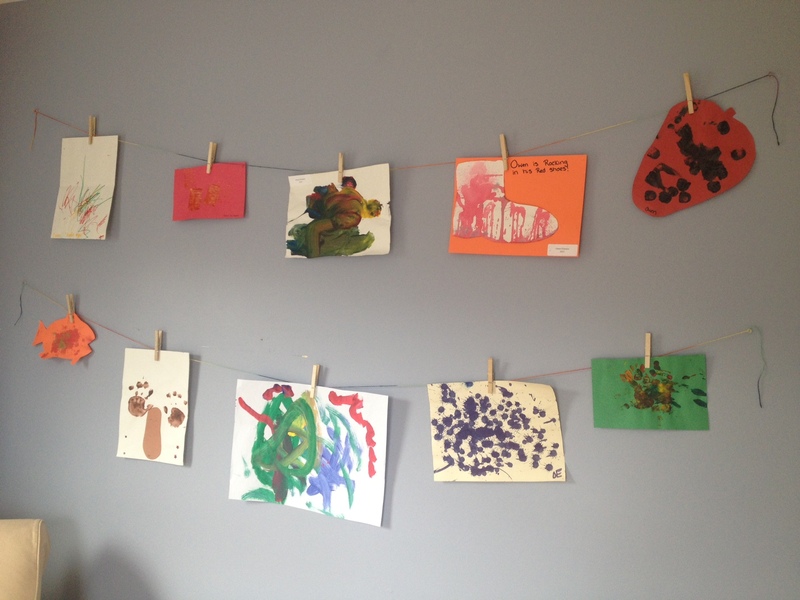 She Says… Uh Oh Pasghettio Nursery Art Giveaway! So yesterday I gave you a little glimpse into the sweet trio of prints that Uh Oh Pasghettio made for Emmett’s nursery, and today I want to tell you a little bit more about them and how you can win a collection of your own. 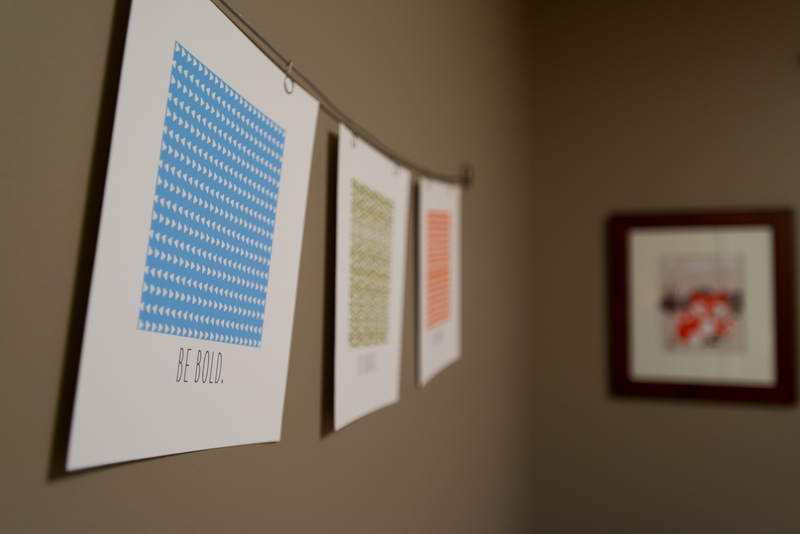 A childhood friend of mine, Amanda Bonaviri, is the art director and designer of these precious prints. Earlier this year she teamed up with marketing guru and friend, Kimberly Howard, to launch Uh Oh Pasghettio. I searched my photo albums high and low for an embarrassing picture of Amanda and I (preferably from that glorious period of time in elementary school when I actually sported a perm AND braces AND glasses at the same time…) but came up dry. So you’ll have to use your imagination. But it’s fair to say Amanda and I have been buddies for a long time and I’ve always, always been in awe of her fashion/style/design sense (Sidenote: She never had a bad-idea perm like me. Go figure.). Uh Oh Pasghettio’s tagline is “colorful prints for stylish kiddos”. Well, I must be a kid too, then, because I want almost all of their prints framed in MY room as well as my little ones’. You can check out their new arrivals, alphabet art, prints & graphics, shower invitations and birthday invitations. All of their designs are clean, modern and super sweet. They even offer custom design. After working with Amanda on the prints for Emmett’s nursery I can assure you that she goes out of her way to tweak her art to make it perfect for YOU (I even sent her pictures of the nursery to match colors, and we discussed changing fonts/graphics), and that the final product is printed on gorgeous, thick, archival paper. Since I was hanging mine on a clothesline-type thing instead of putting it in a frame, this was particularly important. Uh Oh Pasghettio just recently launched their Collections. Amanda uses her awesome eye for style to mix and match their colorful alphabet art and hand-drawn prints. They make it so easy to expertly decorate a nursery wall or playroom in just one click (and no one will ever know you didn’t curate them yourself)! This map print is one of my all-time faves. Hidden away in the nursery? Pshhh. I want this one printed HUGE over my fireplace. I love the coordinating prints Amanda chose to go with it too. And how sweet is this group of prints? The “playroom rules” crack me up. Ok, ok, enough about how much I love all of the prints. Want to know how you can win a collection of your very own (or the best holiday gift ever for someone you love)? Leave me a comment telling me if YOU rocked the perm/glasses/braces look like me when you were younger, or if you were the incredibly cool and fashionable friend like Amanda. Then check out Uh Oh Pasghettio’s website and tell me which collection you’d like to win. Join Uh Oh Pasghettio’s mailing list to hear from them once in a while. I’ve been on the list for a few months now and have only received one or two emails (with coupon codes! ), so don’t worry about getting spammed by them. LEAVE ME A COMMENT HERE TO LET ME KNOW YOU’VE DONE THAT. Like Uh Oh Pasghettio on Facebook. I follow them and love what they post. LEAVE ME A COMMENT HERE TO LET ME KNOW YOU’VE DONE THAT. The winner will be randomly chosen from the comments on Monday, December 9 (in time for holiday shipping), so you have until midnight on Sunday, December 8 to enter. 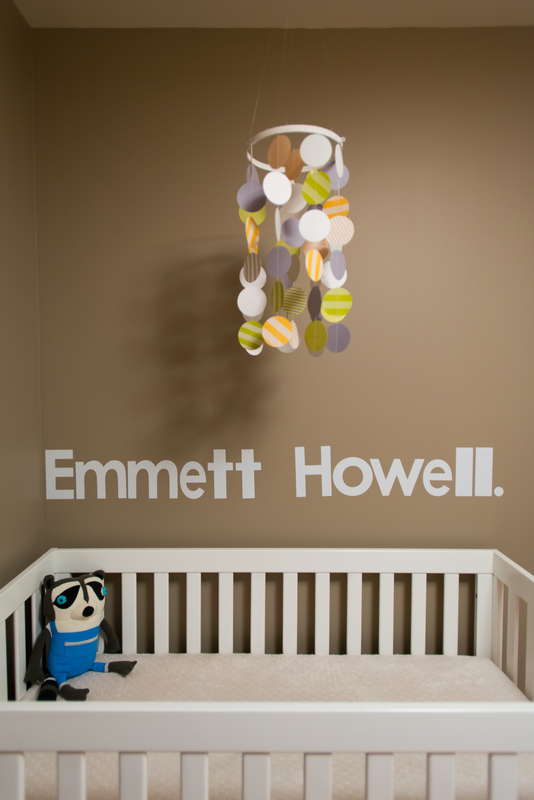 Emmett is almost 5 months old, but I’m just getting around to sharing his nursery reveal now. (Looking back, apparently I did the same thing with Owen’s nursery). Now I guess it’s not so much a “reveal” as a “hey, my 2nd baby has a room”, but, I know some of you might want to see how it turned out. The room itself is super small. We had a queen mattress on the floor in there before Emmett was here and there was barely enough room for anything else. So as Emmett grows we will likely have to switch his room with the playroom down the hall (much bigger), but for now, the tiny little room makes for a super sweet, cozy little nursery. I love the warmth of the grey/brown walls, and the way the whites pop off of the saturated color. I used furniture we already had, and pieces of Owen’s crib bedding (that I had made for him) and used those colors as a jumping off point for the room. 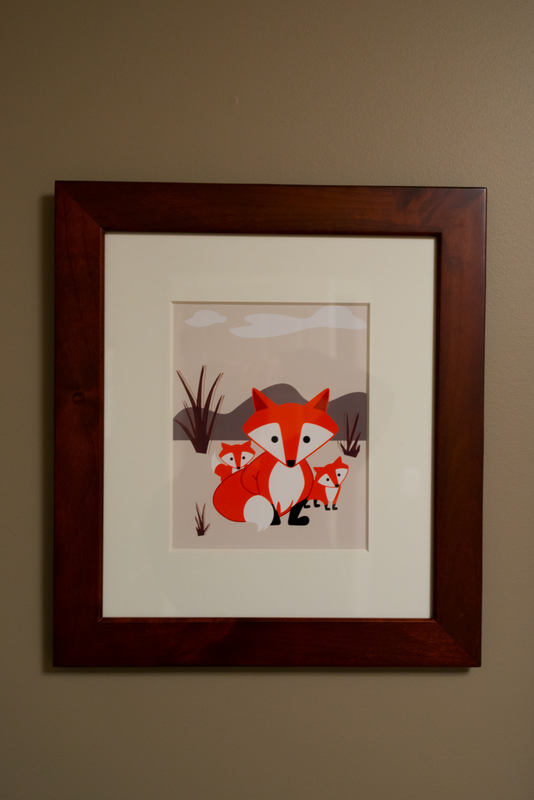 Even with a similar color scheme, it turned out so differently from Owen’s nursery. I made the mobile (just like I did for Owen’s room), but this one was much simpler and I’m much happier with how it turned out. To anyone who wants to DIY, it was a really quick and easy project! I popped circles out of craft paper with my hole puncher and then just sewed them together in a straight light with my sewing machine. Then I tied the strings onto a painted embroidery hoop and hung with fishing wire. My sister cut the letters out of wall vinyl for me and all I had to do was peel and stick. The fox print was from a cute shop I found on Etsy (details below). The framed alphabet print above the changing table (from Fab.com) was actually a gift from Benjamin to me last Christmas. I think he had intended it for Owen’s big boy room that we were thinking about at the time, but as soon as I saw it I got all teary-eyed as I immediately saw the nursery for our Baby #2 come together. We didn’t even know if Emmett was a boy or a girl at that point, but the nursery would have been almost the same. The 3 personalized prints that say “Be Bold. Be Bright. 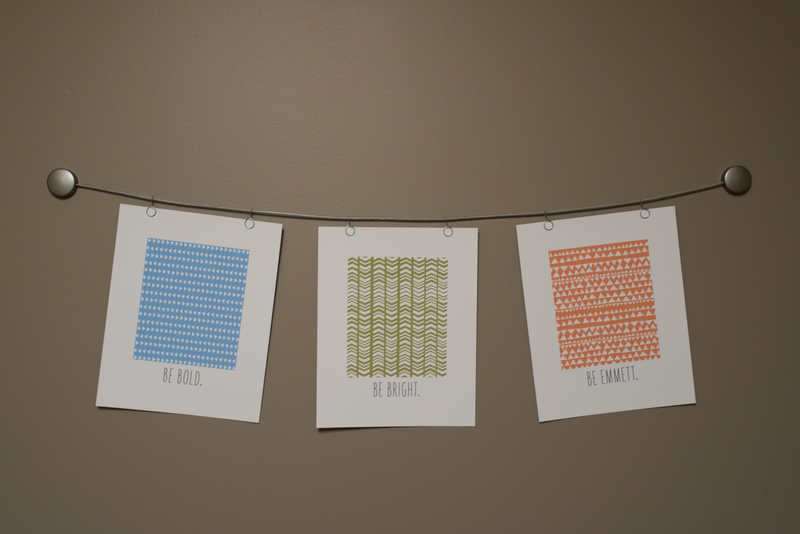 Be Emmett.” were made by a super talented friend of mine who is the creative director behind Uh Oh Pasghettio, a graphic design boutique that has adorable wall art and invitations perfect for nurseries/kids’ rooms. This trio is available as part of their “collections” (cute coordinating prints that look great together). Uh Oh Pasghettio has offered to give away a whole collection to a lucky reader! You don’t want to miss it. Just in time for holiday gifting or brightening up your child’s room for the new year. Check back tomorrow for details about the giveaway. I have written before about how fire alarms are Owen’s biggest fear. For a kid who seems to have NO fear leaping off of climbing structures taller than my head or starting up a conversation with a complete stranger, it still baffles me that he completely flips over something as commonplace as a fire alarm. But hey. It’s loud. I get it. And I know the bone-shaking fear from hearing my own house alarm go off unexpectedly. So in the middle of the night on Saturday, I knew exactly whose room I had to run to first when I heard our fire alarms blare. I was out of bed and standing in the hallway before I even woke up fully. With my hand on Owen’s door, I waited for him to call for me before I busted in, while simultaneously trying to make sense of the alarms (I didn’t smell smoke or see fire and feverishly debated the likelihood of false alarm vs. real emergency). A few seconds later Benjamin stood in our bedroom doorway. He had just gotten back from a trip at midnight that night and I hadn’t even seen him yet (despite the fact that we were sleeping next to each other when the alarm went off). I jumped out of bed without even remembering he was right beside me. In his grogginess he assumed it was our house alarm system going off, and said, “Can you run down and turn it off?”. 1. I knew that it was the fire alarm and I couldn’t just turn it off. But when he asked me this, he completely confused me and I began to doubt myself. Also, I learned my lesson the last time our house alarm DID go off that I shouldn’t just run down and turn it off — what if there was an intruder in the house?! 2. I was frozen outside of Owen’s room. I literally couldn’t move my body to do anything other than gather my babies amidst the crazy loud beeping. I clutched him and ran down the stairs. As soon as I did, I realized the sound was much quieter. It was our upstairs alarms going off. They are all wired into the house but apparently they don’t all go off at the same time. Who knew. I opened the front door of the house and held Owen outside, assuming that Benjamin was, I don’t know, handling everything else? I couldn’t bring myself to put Owen down but I wanted to grab Emmett as well, and didn’t feel comfortable leaving Owen on our front porch alone. So I ran back upstairs still carrying Owen to Emmett’s room. As soon as I opened his door (he was totally fine, by the way, barely phased by the noise) I realized what had happened. It was his humidifier. It had to be. It was the only thing that was different about that night as opposed to other nights. And the very same humidifier had set off the fire alarm in Owen’s room one time, a long LONG time ago (when he was tiny enough that the alarm didn’t even wake him). I told Benjamin what it was and he quickly ripped the fire alarm in Emmett’s room out of the ceiling. Emmett cooed happily as he realized I was going to feed him since I was awake and he normally wakes around then anyway. Babies are easy. Owen shuffled back to bed rubbing his eyes and asking adorable and yet painfully sad questions like, “Is the alarm ever going to stop beeping?” and “The alarm only goes off when there is a fire… is there a fire? Are we going to get burned?”. And, finally, “Can I sleep in your bed?”. 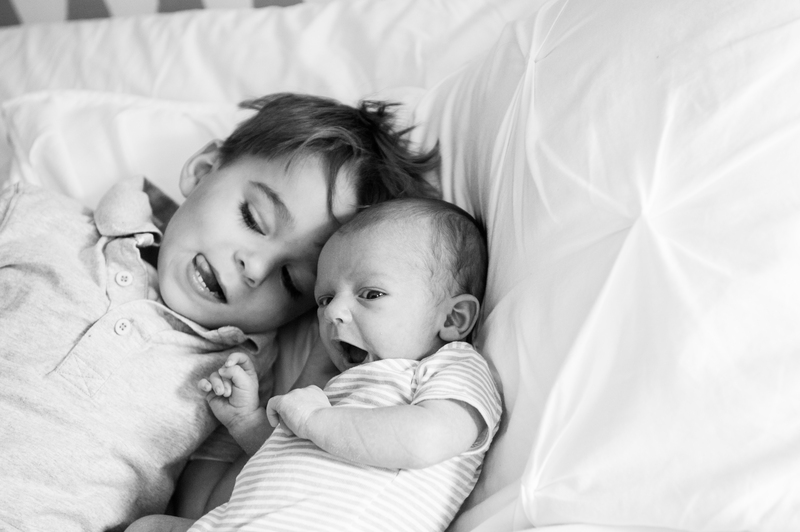 Almost as soon as both boys were settled back in their beds, Owen cried out again. He SWORE up and down that he could still hear the beeping in his sleep. I rubbed his back and asked him if he could hear it right now. “Yes. It won’t stop”. The poor kid was so traumatized he could still hear the ringing and it was keeping him awake. After two more night visits to his room to reassure him, he finally fell asleep. The last thing he said to me? “Can I tell all my friends at school about this tomorrow?”. And while I’m so relieved it wasn’t a real fire, I’m super annoyed that I can’t seem to use a humidifier in my kids’ bedrooms (Emmett’s room is TINY so maybe I just have to turn down the setting, but I’m not willing to test that theory by possibly making the alarm go off again). Has anyone else had this happen? Even in Owen’s room, which is much larger, I can only put it on half power. It’s no secret that my lovely husband is good with a camera. 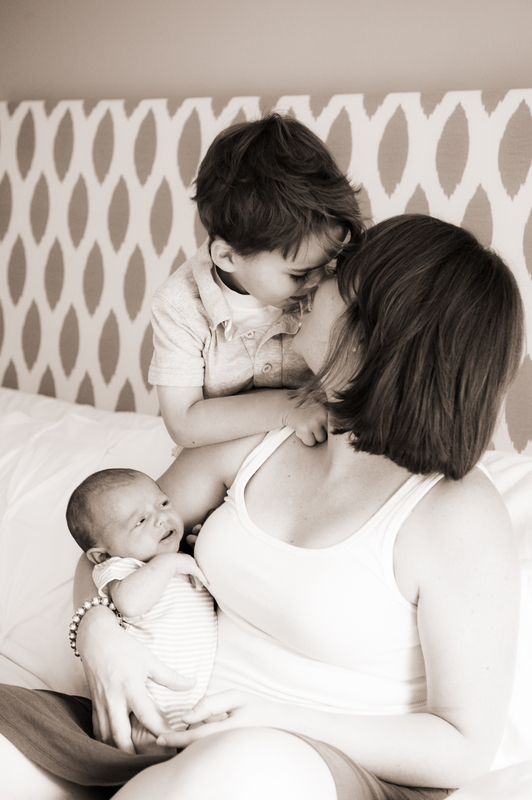 As a result, we have an abundance of gorgeous photos of our family. However, they all have one thing in common: they don’t include Benjamin. I make a point to turn the camera around on him once in a while, and while I’m not half-bad as a photographer, I’m nowhere near a professional. And then, of course, the pictures are lacking another important member of our family (me! ), so they are still not complete. 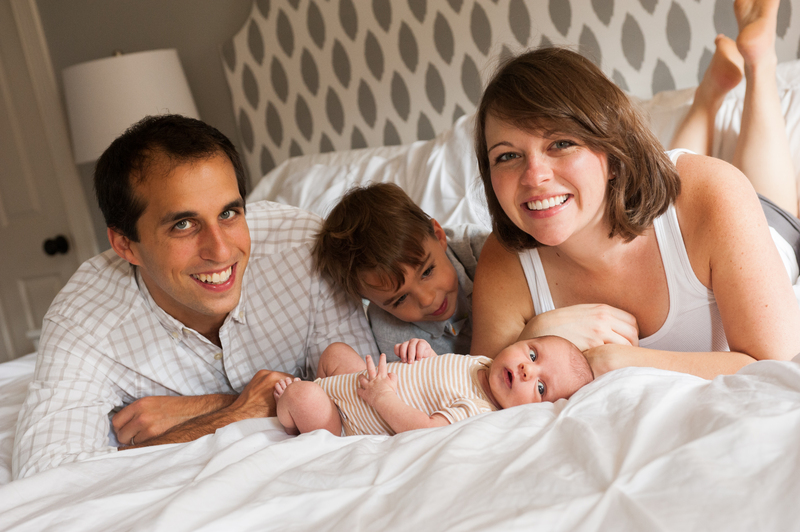 Enter my talented, professional photographer friend Elizabeth of Elizabeth Horne Photography. She takes amazing pictures. 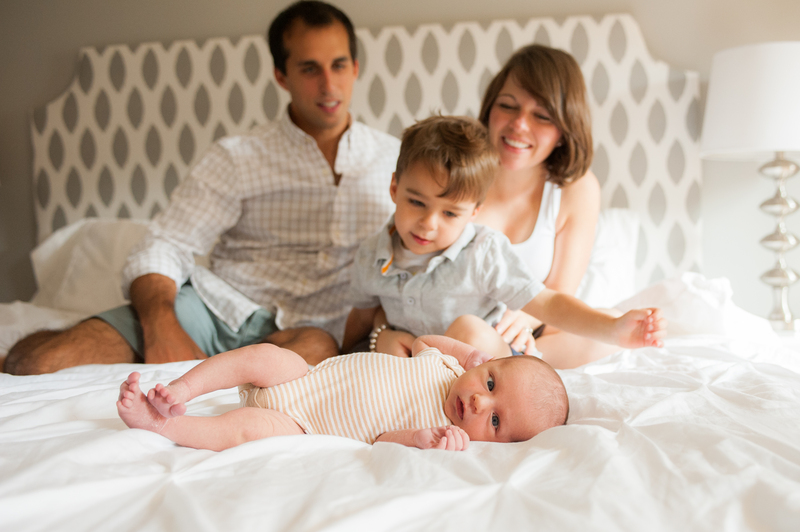 She came over a couple weeks ago to capture the beginning of our little family of 4. I can’t even begin to pick my favorites. I love them all. 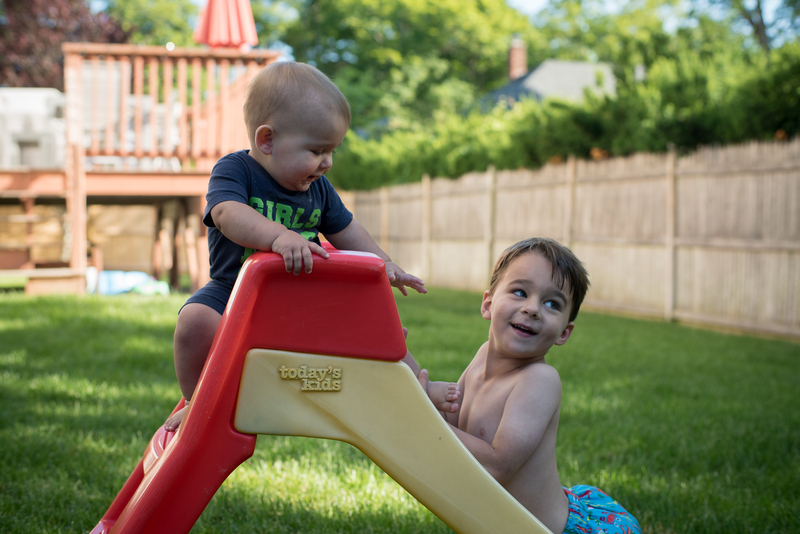 She captured that twinkle in Owen’s eye, and his nonstop rambunctiousness. 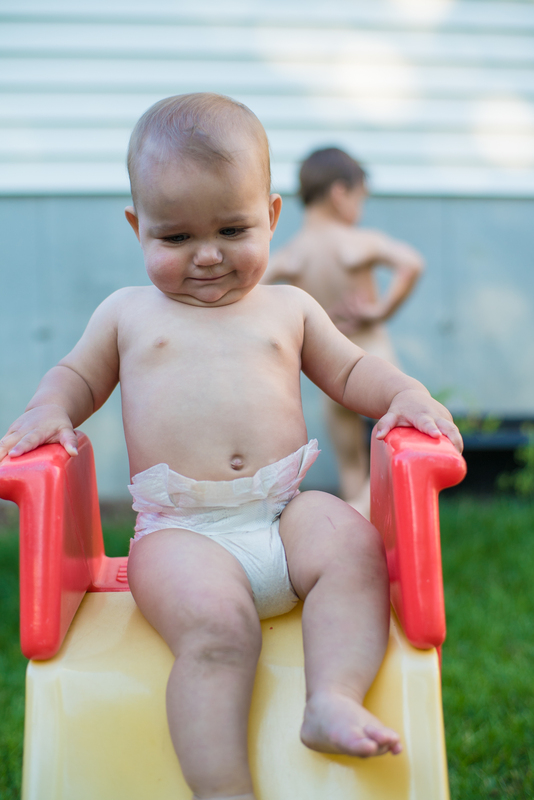 I know firsthand how hard it is to catch this kid being STILL for even a second, which makes these images even more impressive. 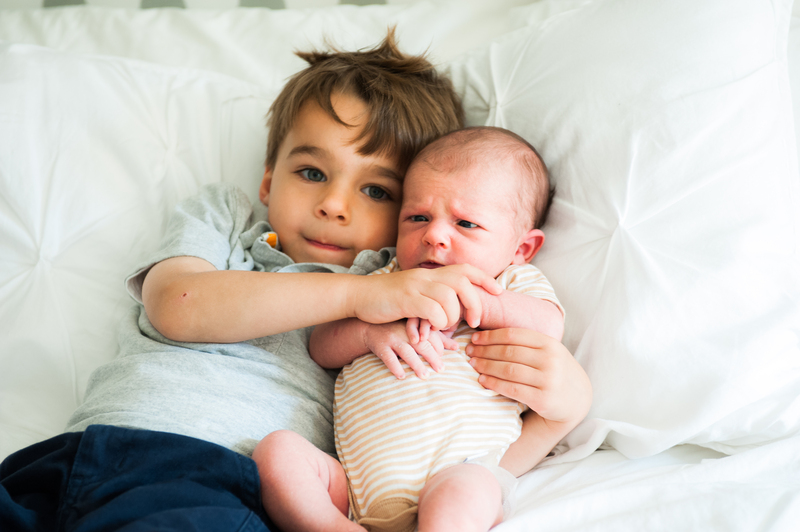 Emmett’s scowl cracks me up. He makes that face a lot — such expressive brows! Me and the boys. It’s still a little surreal to say “the boys”. A rare, sweet, quiet moment with just Emmett. Any attempts at a family photo were foiled (enhanced?) by Owen’s hilariousness. I must say, though, I love these even more than a “perfect” one with everyone looking at the camera and smiling at the same time. That’s our family, in a nutshell. Welcome to the craziness, Emmett. Major work of all kinds going on in our house this week. Yes, I’m still working. From home, these days, so I really can’t complain too much. I’m mentally and physically quite DONE with sitting in front of a computer, but every day I am more and more certain that I’ve completed everything I need to complete to be able to have a stress-free maternity leave. Well, free from work stress, at least. So although it’s annoying to still be on conference calls (and fielding all of the ridiculous “Haven’t you had that baby yet?” comments), it’s keeping me busy and it feels like I’m still accomplishing things, even though delivering a baby isn’t one of them. As soon as we head to the hospital… I’m out! 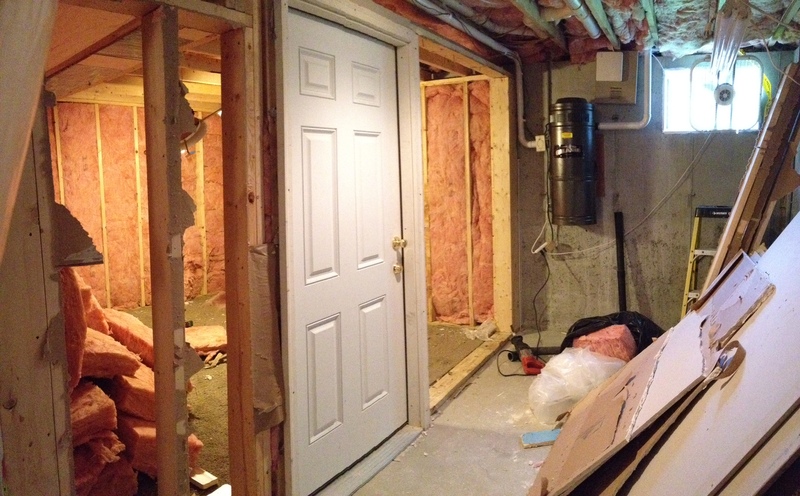 I haven’t given too many updates about our basement renovation but it is going really, really well. We “broke ground” right after Memorial Day and the project was estimated by our contractor to take 4 weeks. I know those estimates usually need to be cushioned by a few weeks, so I was expecting 5-6 weeks, which meant the job would finish about a week before my due date. 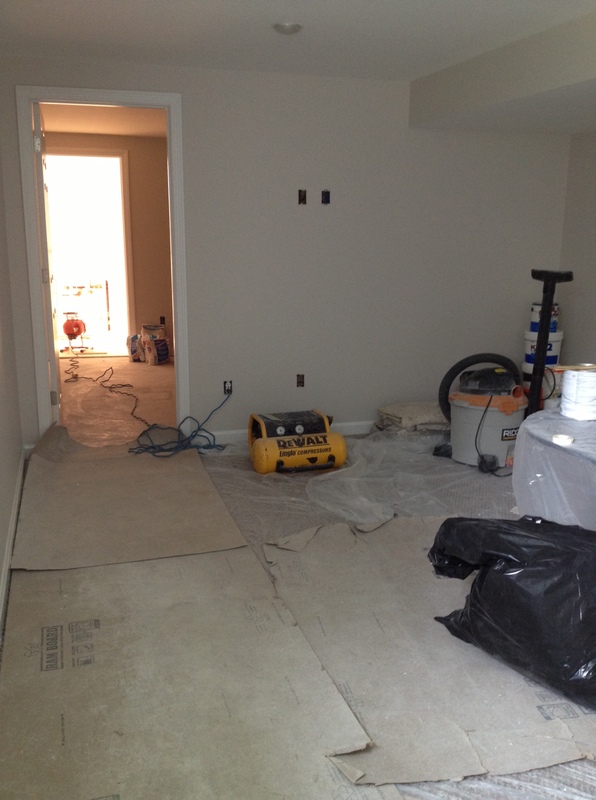 We had one setback (completely our fault, not his) that made us lose about 1.5 weeks, so the fact that we’re finishing up early next week means that the contractor was actually right on with his timeline. That almost never happens! Essentially, since we are taking up our guest room for the baby’s nursery, we wanted to add a bedroom and bathroom in the unfinished space in our basement (half of it is currently finished, and half is unfinished storage space, but it all has full height ceilings) so guests can come stay and have their own space. While this is nice for them, it’s REALLY nice for me, so I don’t have to worry about guests waking up my kids when they go to bed at night. As an interior designer who missed her calling (or, rather, dropped out of design school when I realized I wasn’t going to make any money for the next decade while I studied architecture, and likely didn’t need that degree if I wanted to do this as a business later in life), I was in heaven picking out paint colors, carpet, tile, bathroom fixtures, etc. Remember this design tv show-esque weekend? Awesome. And now we are nearly done. 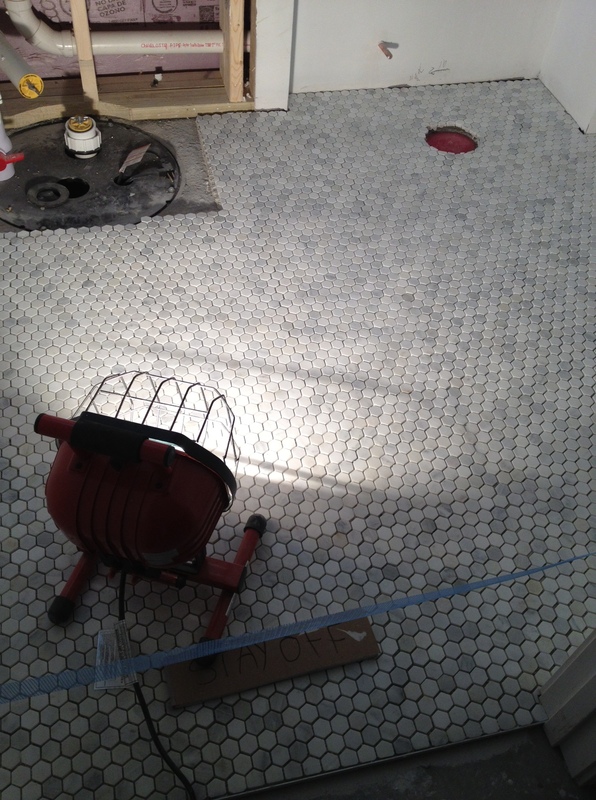 The plumber is down there today finishing up the toilet and shower and sink hook-ups, and all that’s left is a bit of painting and some carpet that’s going in on Saturday. Inspections early next week and then it’s ready for our first guest — my mom, who is going to come as soon as she gets the call that the baby is on his way! I am so thrilled I can barely contain myself. I definitely thought we’d have a baby by now, but the last few days of watching all of this come together has been a wonderful distraction. Oh, friends. So many “signs of labor” going on, I honestly can’t believe we’re not in the hospital yet. I had a midwife appointment on Wednesday and she confirmed that I’m now up to 3cm dilated and 75% effaced. She stripped my membranes for good measure (even though she doesn’t usually do that until 40 weeks and I was just over 39 weeks). A few hours before my appointment I started having some pretty serious contractions that were coming every 10 minutes from 1pm until about 9pm. I thought maybe the membrane-stripping had been at the PERFECT time and would tip the scale and send me into active labor, but alas, when I got in bed at 10pm they were more like 20 minutes apart and not quite as regular. Another good night’s sleep (which is great, except that I was anxious to wake up in the hospital and not in my own bed). Thursday I had a similar experience of very regular (and pretty painful) contractions all afternoon, and then by bedtime, nothing. I guess I should be thankful that I’m getting the nights “off” to sleep, but I’d really rather things just get real and get moving. Today, not so many contractions but some other, uhh, lovely symptoms, that I won’t go into detail about since friends and family are readers now 🙂 Suffice to say, if you’ve been pregnant before, you’ve “lost” this as well. So that plus a lot of cramping gives me hope that maybe I won’t be going back to work on Tuesday, and maybe this baby WILL arrive before his due date after all. But we shall see. So. Now the race is on. 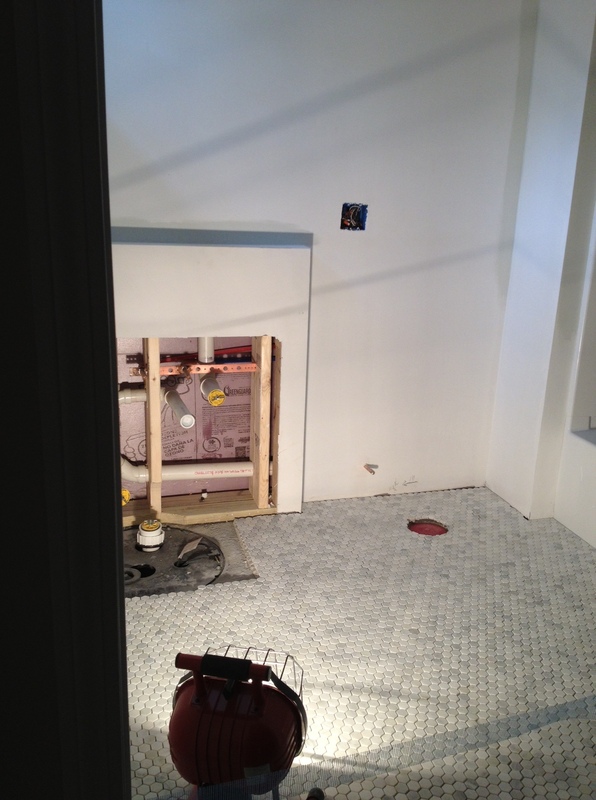 Which will be finished first… the baby or the renovation? 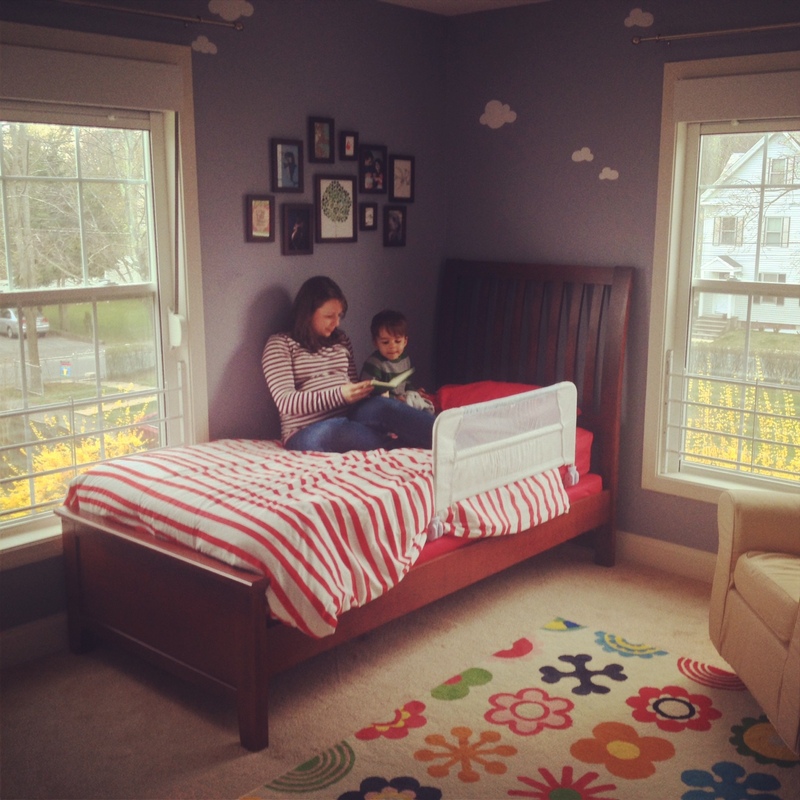 When I was pregnant with Owen I was nesting and decorating and futzing with the nursery from the day I found out I was pregnant. I went into overdrive when I found out he was a boy, and was “ready” (in the “house is ready” sense of that word) for him so early. This time? 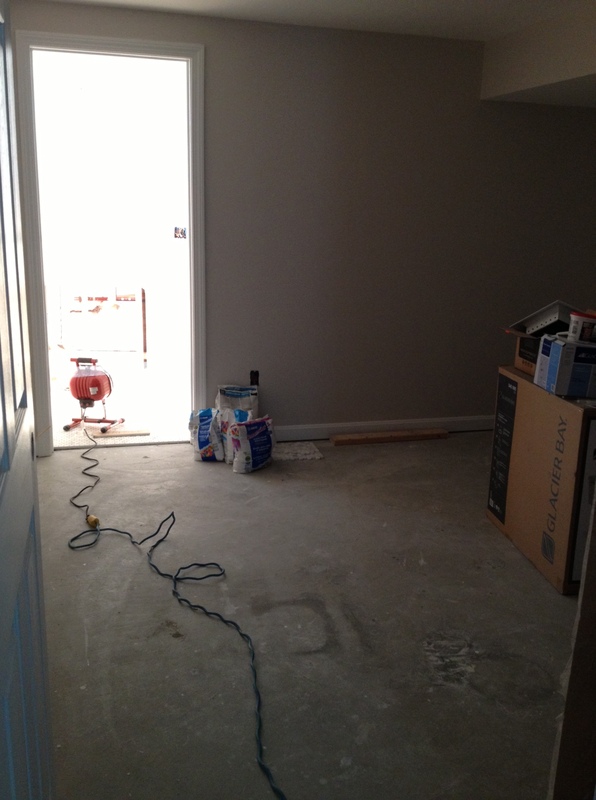 This time I’m a mere 6 or 7 weeks from meeting the little guy and the nursery still looks mostly like a storage closet. Hey, the crib, changing table and glider are built and in the room, so if we HAD to bring the baby home tomorrow, all I’d have to do are put on the sheet and changing pad cover (which are already washed thankyouverymuch). So the necessities are there. But the cute stuff? The details that I love dreaming about? Well, for now they are still all in my head. But while we haven’t had the time to start accessorizing the nursery or even pick up newborn diapers at the store, we HAVE found the time to embark on a huge nesting project outside of the nursery. 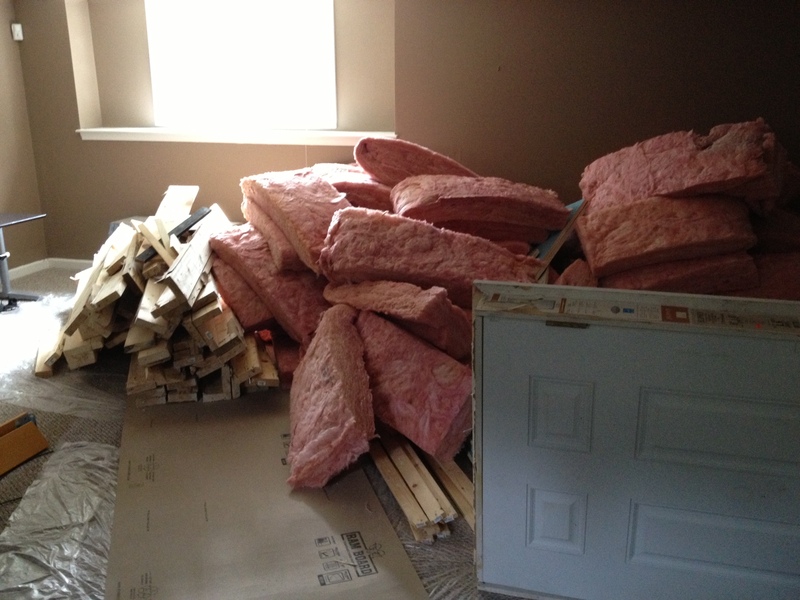 EXTREME NESTING: The uncontrollable urge to start a huge construction/renovation project on one’s home while pregnant. The completion date may or may not be dangerously close to the baby’s due date. The pregnant woman who conceived of the project may or may not be physically able to help in any way due to her huge and unwieldy belly. Apparently it’s quite a common affliction for pregnant ladies, if my friends are any indication. I posted about our project on Facebook yesterday and countless friends responded with hilarious stories of their own extreme nesting — some good, and some miserable. Despite the fact that our house is pretty new and has lots of space, the nursery is taking over the one real “guest room” space we had available. Since we’re expecting a lot of different family visits over this summer and in the coming years, we figured it was as good a time as any to renovate our already half-finished basement (aka Benjamin’s office) and add a guest room with bathroom. As good a time as any, that is, unless it overlaps with having a newborn at home. You know, that doesn’t sound so good at all. Nevertheless, we broke ground on the project yesterday. The contractor took one look at the watermelon in my stomach and joked, “We better get going! That bomb’s gonna go off soon!”. Damn right, dude. Get to work. He says 3-4 weeks, so I’m assuming 5 or 6. Which puts the completion date RIIIIIIGHT around the time I’m expecting to pop this baby out (based on the possibly false assumption that he’s going to come early like his big brother did). So everyone please cross your fingers that both of our timelines stay on course and there aren’t any surprises. Did you experience Extreme Nesting? How did it turn out? If you’ve kept up on the news about what went down in Boston last week, you know that Friday was a crazy end to an already crazy week. Though life felt relatively normal for us (we were not part of the lockdown or police searches), behind the “normal” exterior, everything was different. Owen’s school was closed on Friday while we were encouraged to stay in our house during the manhunt for the second bomber, and I struggled to catch headlines and stay up-to-date via my phone so Owen wasn’t hearing/seeing the coverage. It was stressful. And exhausting. And the second Owen went to bed I was glued to the television. We were so relieved to hear the news of the bomber’s capture late Friday night, and I spent the rest of the weekend almost completely unplugged from all news/social media/email in a sort of backlash against the time I had spent pouring over media during the week. On a MUCH lighter note, the switch to the big boy bed that I have written/obsessed about far too much happened last Thursday, amidst the craziness. The bed was delivered and assembled while he was at school. It worked out really well because we were able to get everything set up and have a “big reveal” when he got home. I knew it would either be a huge success or a total failure. So far (we’re on night 5 tonight), he has stayed in bed and called for me in the morning. A few early wakeups, mostly due to being excited about the bed and also the fact that my mom was visiting this weekend and he wanted to see her as soon as he woke up. I’m considering that a huge success since I was scared he’d be out of the bed on night 1 and not sleeping at all. So… big boy bed for the win! The transition also meant that we moved the changing table and the crib into the new baby’s room, and it has gotten me REALLY excited that we’re actually going to have a little person to put into that room very soon. My mom helped me get out all of the boxes of tiny baby clothes and clean out things like swings and baby seats that have been in our attic/basement since we moved. It’s making our NEXT big transition feel a whole lot more real! Fingers crossed that the big boy bed maintains its allure and Owen continues to believe he really can’t get out on his own. So far, so good.